Offset wrench used for removing nuts under vacuum pump on ALH engines. 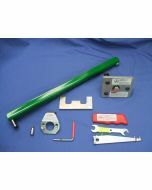 This wrench is used on A4 chassis cars with the ALH engine code and manual transmission. It allows for access to the 10mm nuts under the vacuum pump that can be difficult to remove without an offset wrench.